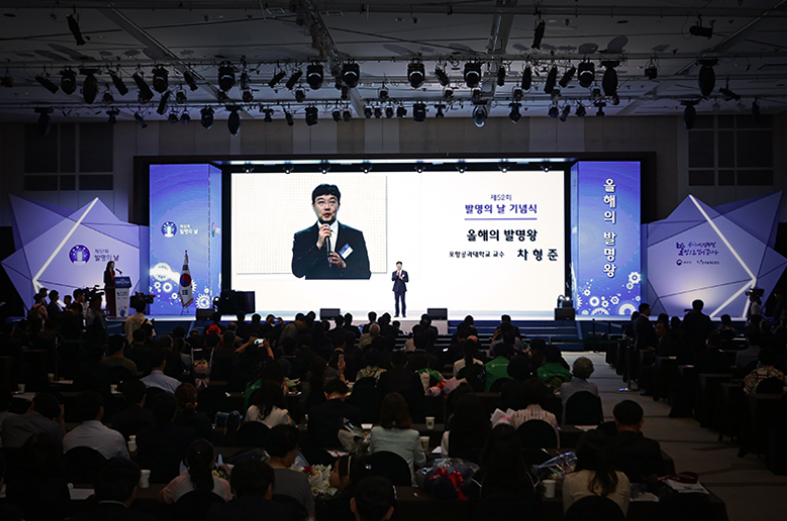 POSTECH Professor Hyung Joon Cha received the Inventor of the Year Award from the Korean Intellectual Property Office (KIPO) at the 52nd Anniversary Ceremony for Korea’s Invention Day on June 14th, 2017. Cha, a professor at the Department of Chemical Engineering, was awarded the honor in recognition of his contribution to developing innovative technologies to produce next-generation materials on a commercial scale. He is the first in the world to engineer mussel protein-based bioadhesive inspired by how mussels attach themselves to underwater surfaces. While commonly used medical adhesives such as cyanoacrylates are chemically derived and likely to provoke an adverse reaction, Cha’s bioadhesive has high compatibility with the human body. In addition, its strong adhesiveness in wet conditions and easy mass production opens possibility for myriad medical applications including tissue engineering, bio-sensors, drug delivery, cosmetics, and veterinary uses. Cha’s invention is expected to increasingly lead the global medical adhesive market with a 50% share, contributing to the advancement of national industries. Since he joined POSTECH in 1999, Cha has created 135 intellectual properties including 23 international patents, 47 domestic patents, 34 international patent applications, and 31 domestic patent applications.